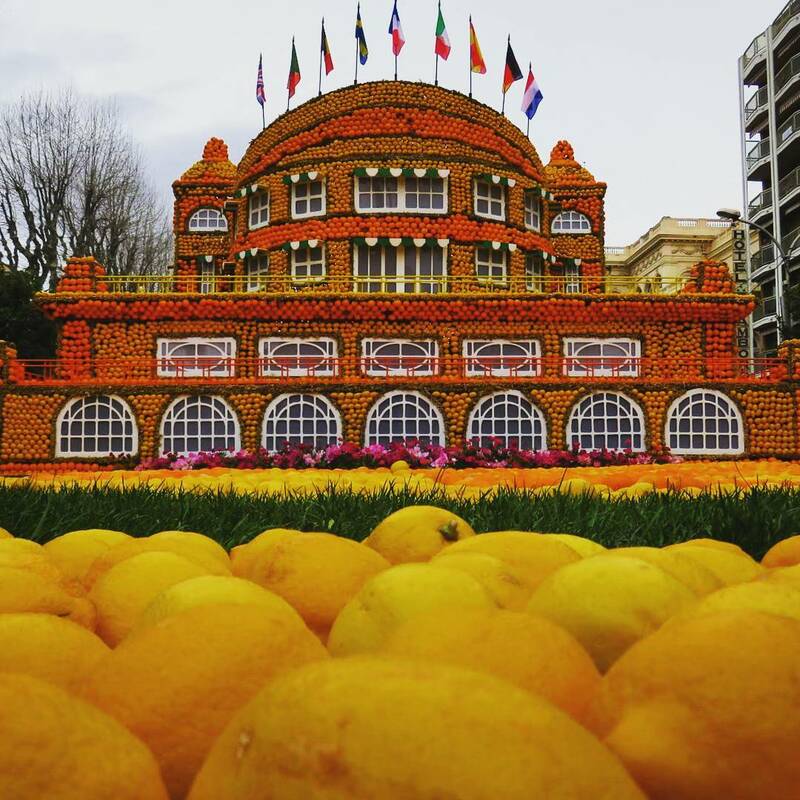 Menton Fête du Citron is all about lemons. 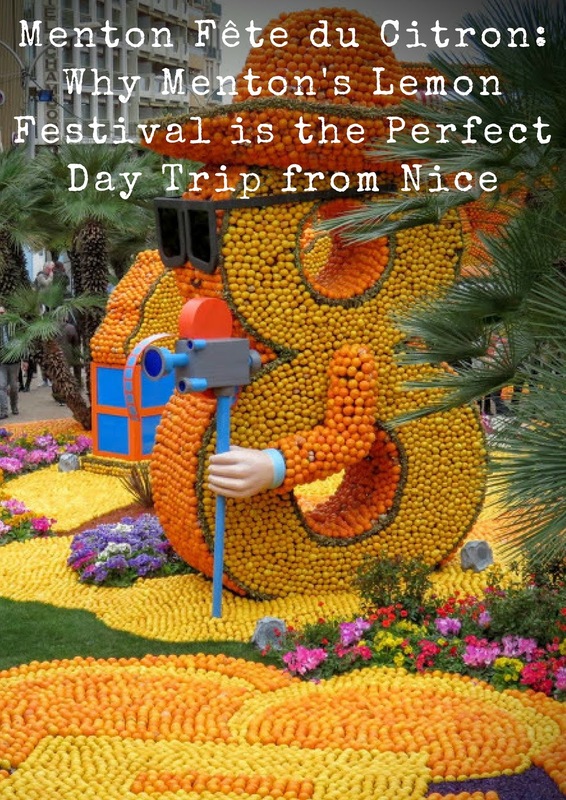 In fact, this famous annual event which takes place at the end of February is also known as the Menton Lemon Festival. 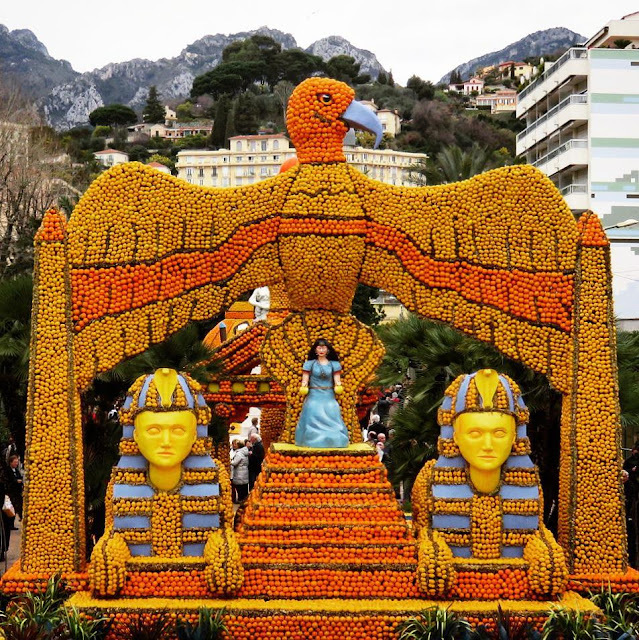 Nice has its streamers, confetti, and flowers for Carnaval, but Menton, located less than an hour away by train near the Italian border decided that when life gives you lemons (and oranges!) make lemonade (or orange juice?). Menton holds a Carnaval style Fete du Citron each year. Festivals are a great excuse to visit off-the-beaten path places and we jumped at the chance to take a day trip from Nice to Menton to get a nice dose of Vitamin C. Below I share some highlights from our visit to Menton during the lemon festival. Menton's Fete du Citron has a theme each year. In 2016, when we visited, the lemon festival theme was Cinecittà harkening back to the cool glamour of Italian cinema in the 1950s and 1960s. This seemed like an interesting choice given that Menton is actually in France, but hey, they are quite close to the border so I can see the Italian cultural influences. The sculpture garden is definitely the highlight of any visit to the Menton Lemon Festival. We handed over 10 EUR each and were admitted to a wonderland of movie scenes come to life and all fashioned out of fruit! Menton itself is lovely. We took a break after our stroll through the citrus sculpture garden to dine al fresco at Le Balico on Place aux Herbes. 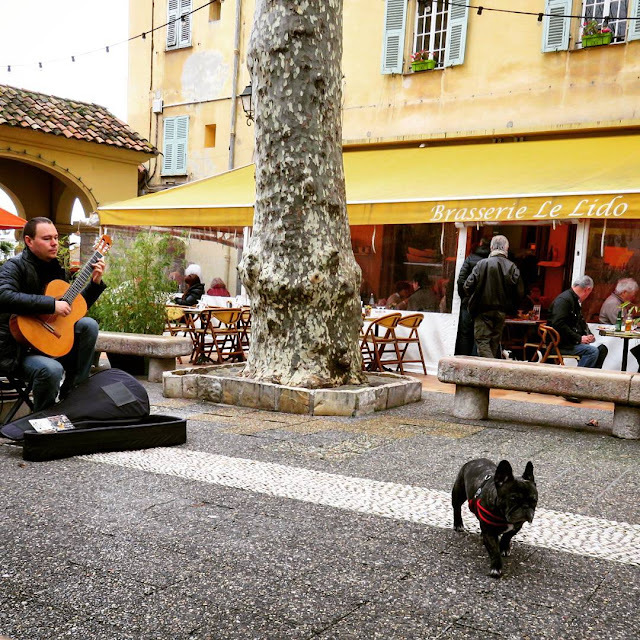 Fueling ourselves with steak and potatoes and sea bass, there was no sun to lift our spirits that day so we had to rely on the guitarist quietly playing behind us and this gray-jowled dog to do the honors. Festival aside, Menton has a lovely atmosphere. The Fete du Citron parade is similar to the Carnaval de Nice parades. Just like in Nice, the Menton Lemon Festival features a ton of streamers and confetti, just a lot more fruit as well. We could smell the essence of oranges in the air as the floats rolled past, each new creation bringing another smile to our faces. After the Menton Lemon Festival parade, we took the opportunity to explore the city's nooks and crannies. We spotted this delightful switchback staircase and made our way to the top for sweeping views of the sea. 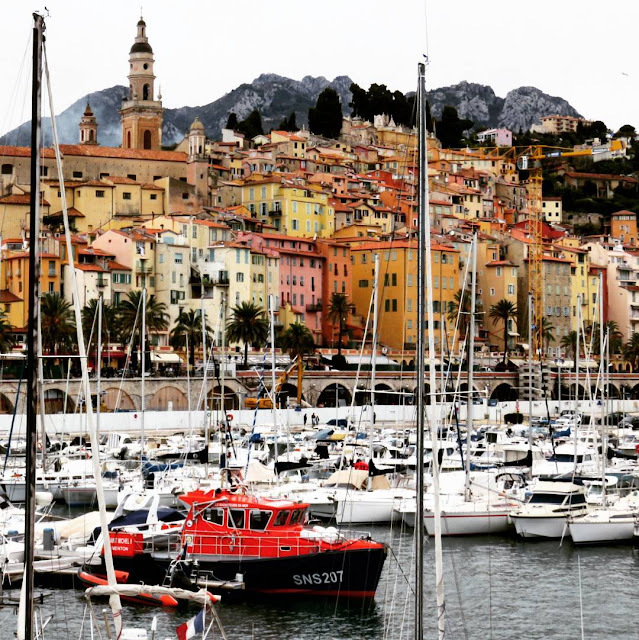 Menton's harbor was also a lovely spot for a walk. The harbor was packed with docked sailboats and as we looked up, this slowly gave way to a jumble of buildings on the hillside. Magnifique! A short breakwall leads from Menton's harbor out to a lighthouse, another great spot to get some views of the Mediterranean and listen to the soothing sounds of crashing waves. Menton's Fete du Citron is an easy day trip from Nice. The Menton Lemon Festival offers the perfect opportunity to visit for a bit of fruit inspired fun. What other destinations do you recommend for combining some sightseeing with a festival? 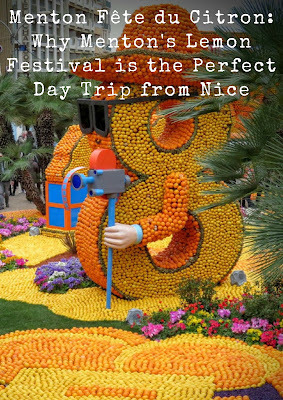 Learn more about Menton Fête du Citron (aka the Menton Lemon Festival) and others things to do in Menton on a day trip from Nice, France.